There’s a new manicure hack in town, and it’s called dip powder nails. It’s very easy to pull off at home, and it is said that it can actually outlast a gel manicure. The color is given by a very pigmented powder, and the process is simple. You apply a base, dip your nails in the color of your choosing and then finish off with a sealant. Nice and easy. However, is it easy to get it off as well? Learn how to remove dip powder nails safely right here. There are two ways in which you can remove the dip powder nails. The good thing about it is that, since there are many layers to this process, the nails should snap right off, just like a little turtle shell. This first method we’ll show you is a step-by-step guide for how to remove dip powder nails at home with nail polish remover. The first thing you need to know is this: Never try to lift the powder nail off your real nail using your bare hands or without having treated it with anything beforehand. This mistake will damage your nail and hurt a lot. Dip a cotton ball in acetone or your regular nail polish remover. Place it over your nail and wrap a piece of tin foil tightly over it. Make sure it covers your finger entirely. Leave it to rest for 20 minutes. Remove the tin foil and the cotton ball. Start to gently press or prod at the powder nail with an orangewood stick. It should come right off, just like an acrylic gel does. If it doesn’t, just soak it longer in acetone. This is an easy way to remove dip powder nails. 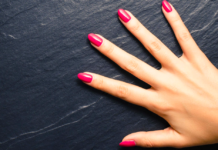 Recommended read – Do Nails Need a Break Between Manicures? Next up is a method that will show you how to remove dip powder nails without acetone. Did you know that acetone is used in paint thinner and is also flammable? These reasons alone should convince you that acetone is a very powerful chemical agent that is best to avoid. Dip your hands in a bowl of warm water for 20 minutes. This process will help dislodge the powder nails a bit and make them come off easier. The next step is to add copious amounts of nail oil all around the nail itself. When you’re done, take your orangewood stick and start prodding at the nails, one at a time. This process might take a bit of time. Be patient and don’t push more than you have to in order to avoid pain. Patience is the key to learning how to remove dip powder nails safely. If you rush this process, the powder nails might take a bit of your own nail with them when you pull them off. Since powder nails harden, they should come off all in one piece without leaving any debris or color on your nail. However, if some is leftover, you can simply wipe it off with a cotton ball dipped in acetone just like you normally would. There you have it: two brief guides on how to remove dip powder nails safely, either using acetone nail polish remover or non-acetone nail polish remover such as nail oil. Just remember to be careful not to do it too fast or to remove the nails too forcefully so you do not to hurt yourself. Other than that, have fun painting your nails! Now that we have covered how to remove dip powder nails at home using a few great methods, we will answer a few frequently asked questions. Is Dip Powder Better Than Acrylic? To answer this question best, we will dive into understanding the main differences between the two. First up, let’s talk about acrylic nails. This method makes the nail hard and damages the nail plate after removal. Acrylics also include chemicals and UV light for drying which are not good things for the health of your nails. These nail colors are pretty, but they wreak havoc on your actual nails. Acrylics stunt the growth of nails, but it gets even worse than that. This nail polish method is a breeding ground for potential infection since you are messing with the nail bed and cuticle. This method adds a top layer of artificial nail to your nail, so you can imagine it does not enhance or aid in the health of your nails. In contrast, nail dipping powder is a method that does not use the typical things that ruin your nails when getting them painted during the acrylic method. Dip powder is an excellent alternative for many reasons. First, this process is much quicker than the time it takes to get acrylics. It also keeps chemicals that damage nails out of the picture which means healthy, pretty nails. Not only does the dip powder not use unhealthy chemicals, but it is infused with vitamins that will improve the health of your nails. It is the best of both worlds. Not only is this a healthier option for your nails, but it is also cheaper and lasts longer than acrylic or acrylic dip nails. Since acrylics essentially put a fake nail on top of the real nail, these chip and break easier than do dip powder nails. These are the reasons why it is the better option to go dip powder over acrylic. It is simply a no brainer that dip powder is a better option than acrylic all around. We say this because one method gets you results at the cost of your nail health, while the other gets you results while also aiding in your nail health. How Long Does Dip Powder Last? We mentioned briefly that dip powder lasts longer than acrylic nails, and truthfully, dip powder lasts longer than most options in general. This long-lasting manicure method outlasts not only acrylic, but gel manicures as well. Everything we have always heard about long-lasting nails is being turned on its head with the emergence of dip powder. Not only do you avoid the damage that comes with getting an acrylic manicure or acrylic powder manicure, but your go-to gel nail polish which may only last two weeks (if you’re lucky) has a new rival. Because this adds a layer to your natural nail and uses plenty of vitamins and oils to strengthen it, this method is even stronger and longer lasting. The way dip nails are laid on is thicker than what you may be used to, and this is part of the reason for their strength. There are plenty of testimonies sharing how this method has lasted users up to four weeks with perfect nails. That’s incredible! It’s annoying to make a trip to the nail salon every week or two weeks, and it’s even more annoying to get a chip and be tempted to peel the whole thing off. If you are looking to spend less money and less time than you ever have before, dip nails are your best bet. This method is taking the world by storm and proving that you can have the best of both: healthy nails and pretty nails. When asking whether dip powder nails work or not, please know this is a loaded question. But in one word: absolutely. Dip nails are an incredible alternative to nail polish. In order to use dip powder, you just dip your nail in the nail powder and then cover the nail with clear nail polish when you have your desired look. This method is the cleanest way to go (since the powder won’t stick to your skin), as well as the longest lasting. 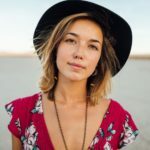 There are testimonies and reviews after testimonies and reviews raving about how amazing this method is. It may be a widespread belief that dip nails take away from the traditional look of gel or acrylic nails since they are not created with a liquid polish, but this is just not the case. When you hold a hand that has a dip powder manicure up against a hand that has a traditional manicure, you will barely be able to see a difference. The only change you can feel is the dip powder being a bit thicker than what you are used to, but this only aids in its strength. Not only does it work, but this method is also safe and actually adds to the health of your nails. The dipped nail is no fake nail, but an added coat that strengthens the natural nail. 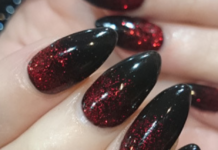 You can get these glossy and popping nails done at home as well as the salon, though we advise having the nails removed by a professional just as you would have a professional remove acrylic nails. When doing dip nails, you can dip the nails as many times as is necessary to change the color and achieve your desired look. Maybe even incorporate some nail art into your manicure or get a dip powder french manicure. This method is the most mess-free and straightforward way to paint nails! One of the biggest things we advise for the best results possible is using high-quality products such as the brand Revel Nail. Regardless of if you are doing a DIY for dip nails or if you are having them done by a professional nail tech, your best outcome will be achieved if you use the highest quality products on the market. Do your research on the best at home nail kits and ask questions if you are visiting the salon. This method works so well that acrylic and gel nails need to watch their backs! There is a new big shot in town called dip nails, and they are taking over the nail industry with innovation and beauty. That does sound super frustrating! My advice would be to try the tactics and strategies we put in the article first, and then if it is still not coming off( which it should), I would go to a salon.